Sprint instead of Long – it makes no difference for Tove Alexandersson, Sweden, who powered round the 4.3 km course in 14.36 to take the Sprint gold by 28 seconds. 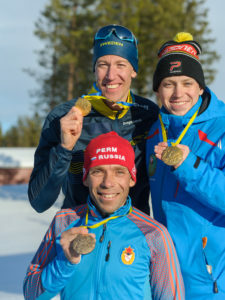 In an exciting finish to the men’s race, the gold was shared by Sergey Gorlanov, Russia and Erik Rost, Sweden. Behind Alexandersson, who was fastest throughout just as in the Long race, Magdalena Olsson and Mariya Kechkina were within a couple of seconds of each other fighting for the silver medal. In the end it was the Swedish athlete Olsson who was faster than the Russian Kechkina by 2 seconds. 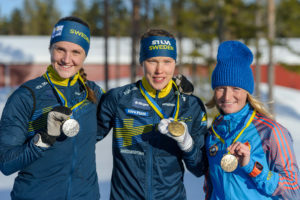 Fourth was the Finn Mirka Suutari, who again showed her strength in Sprint – she was silver medallist in Sprint at the European Championships 2 years ago. Daisy Kudre, Estonia took a creditable fifth place. Erik Rost set a new best time in the men’s race for the last group of starters to try to match. At various stages Sergey Gorlanov, Vladislav Kiselev, Eduard Khrennikov and Lars Moholdt all seemed to have possible victory within their grasp. But it was Gorlanov, straining every sinew in his dash along the run-in to the finish, who collapsed over the line in a time exactly matching Rost’s. Khrennikov belied his 45 years of age in taking the bronze medal by 1 second over Kiselev. The courses were fast and technical with some subtle route choices, especially on some of the shorter legs. The day started in bright sunshine, but a heavy rain shower greeted the final men into the finish. Tomorrow is a rest day, and competition resumes on Saturday with the mass-start Middle distance races. The men start at 10.00 and the women at 11.10.